Masayoshi started his talk in an unconventional way, asking everyone to close their eyes for moment, and then open them again. Within a few seconds he made the whole audience understand that your eyes give you a completely different experience of the world around you. 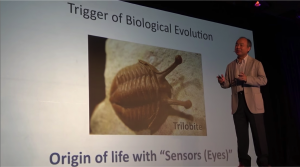 Masayoshi then started his presentation with a picture of a trilobite, an early animal that roamed our oceans for over 270 million years until it went extinct about 250 million years ago. The trilobite was the first species with complex, compound eyes. Both predators and prey developed similar improvements in eyesight. This ability to see is believed to be one of the key evolutionary pressures that caused a rapid development of new life forms during what is known as the Cambrian Explosion, a relatively short evolutionary event during which many new animal species appeared. At this moment Masayoshi had clearly set the stage, first showing that our eyes are so crucial to us, following by the importance that eyes played in developing so many of the living things around us. He noted it’s not just sight that is important, but sensing in general. Being able to smell, hear or touch. Once you can sense, next steps are to recognize, learn, and act upon it. He then quickly made the connection to IoT, showing that in 2018 there will have been more IoT devices shipped than mobile phones. The center of gravity will have moved from PCs to mobiles to IoT. In the next 20 years, whatever happens on Earth will be sensed and converted by smart silicon chips into data, which will be transmitted into the cloud for further processing. 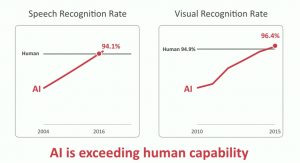 He then went on to show that today’s intelligent algorithms already perform extremely well at recognizing speech and images, even surpassing human capabilities. These techniques have already been applied successfully to many different applications in gaming, art, healthcare, robotics, and language translation. Combining this sensing everywhere with the power of artificial intelligence will result in a singularity where artificial superintelligence will abruptly trigger runaway technological growth, resulting in unfathomable changes to human civilization, making people happier and live longer. In short, his talk was all about computer vision and artificial intelligence. No word about CPUs or GPUs let alone standard cell libraries or SRAM. Instead, Masayoshi showed us a future where a tsunami of a trillion electronic devices arrives, where each device understands and acts upon its surrounds using the power of sight. Perhaps we shouldn’t call this upcoming new electronic revolution the Internet of Things, but the SoT, the Sight of Things. We’re excited at videantis to be working on key required technology for this future to become reality. Our vision processor efficiently performs the extreme compute task of translating the captured pixels into meaningful data. These IoT devices need to be very powerful yet at the same time tiny and operate with minimal power consumption. Our team of experts has already been working on such technology for well over a decade, resulting in a solution that runs a wide range of embedded vision applications and algorithms in a smaller silicon footprint and with much lower power consumption than what’s available on the market.